I very rarely speed test now, but have just done and still getting full speed. Only time I really check mine is if things feel 'off'. I have tons of telemetry I could consult but no real point unless I need to: graph watching for the sake of it is pointless. VM call their top tier the 'vanity' tier for good reason. I have the service I do because it's what VM Business sell a I have clear requirements - it services a branch office and remote lab that happen to be in our house. As I recall Max / Phil you are a light user. Price is more important to you than other things due to a restricted and fixed income. Even via FTTP the price difference between the 76Mb product and the next one up is notable. I managed to find a live G.Fast cabinet attached to my exchange (Aberkenfig, SWAAZ) so they must be turning it on slowly but surely. The line I managed to randomly hit upon (about half a mile from where I live) could get the full 330Mbit on G.Fast. Lucky sods. I can now confirm that my cabinet now has G.Fast enabled. As predicted, I do not even get a G.Fast speed update, but properties right by the cabinet are showing as the full 330Mbps. Hmm, the plot thickens. 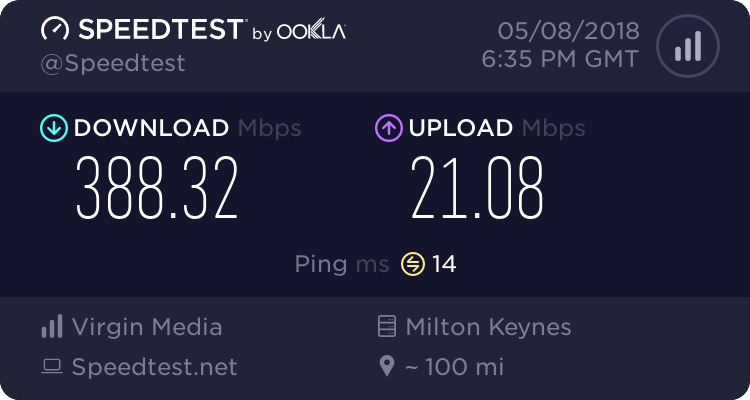 So, the other side of my street, (connected admittedly to a different cabinet) can apparently all get 1000Mbps FTTP! I agree with both ADSLMax and Kitz. From 49k, plus x2 - x4 MPPC compression on dialup, to 500k DSL originally, to 2 - 2.2 / 0.5 Mbps sync rate with ‘ADSLMax’ G.992.1 20CN, to 3.25 / 0.55 Mbps sync rate (an all-time high d/s sync rate today) and G.992.3 21CN today, I am not doing too badly. Not sure there is any plot here to thicken here. My 1st guess would be it's a further away cabinet serving the other half of the street. If they have below 24Mb FTTC estimates they may have got FTTP via BDUK. It could also be someone has ordered FTTPoD. If that's the case there will only be a small grouping with FTTP. They usually only enable neighbours on the same copper DP. No indeed, different cabinet, I checked again. 2019 and still not live - originally attached to PCPs in July/August of 2017. Until 2021 then your goes live! Only joke! That's fine. I'm too far away to take the service and will have moved to an FTTP area by the end of the year. Not to mention VM will be faster both downstream and upstream by the end of this year most likely.